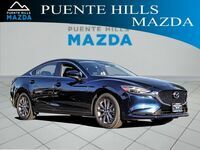 We love doing vehicle comparison here at Puente Hills Mazda, because the Mazda brand never fails to impress us. 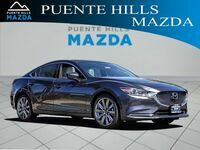 Today, we want to compare the 2018 Mazda6 Sport to the 2018 Toyota Camry L. These two vehicles are similar in their size and performance. Each of them is powered by a 2.5 L I4 4-cylinder, 16-valve standard engine. 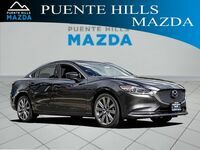 The Mazda6 Sport has more torque at a lower rpm, while the Camry has more horsepower at a higher rpm. Both vehicles come with a ton of safety features. They each have a rear-view camera and Forward Obstruction Warning (FOW). Now that you know what makes them comparable vehicles, we want to dive into the differences between the two vehicles, starting with a side-by-side chart. 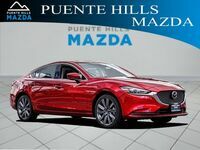 Stay with us to learn how the 2018 Mazda6 Sport differs from the 2018 Toyota Camry L.
The chart above begins to highlight the fact that the 2018 Mazda6 Sport has many features that are not available on the 2018 Toyota Camry L, and that is what we are going to focus on. 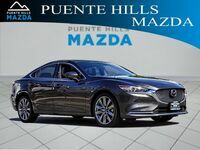 Automatic Climate Control with separate climate controls for the driver and front passenger are a standard feature on the 2018 Mazda6 Sport, but not available on the 2018 Toyota Camry L. These features will make a world of difference to you and your front passenger, especially if you prefer different temperatures all the time. 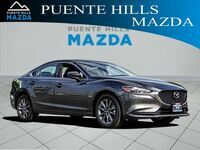 The 2018 Mazda6 Sport also comes with a leather steering wheel, and an optional interior auto day and night mirror or electrochromic mirror. 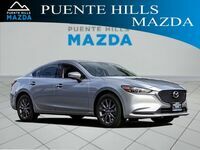 These design features are also not available on the 2018 Toyota Camry L. On the exterior, you will notice the signaling exterior mirrors and alloy wheels of the 2018 Mazda6 Sport, yet again not available on the 2018 Toyota Camry L.
Other than all of the extra features you will enjoy in the 2018 Mazda6 Sport, you can also make use of the extra foot room in the front and rear seating. Stretch out and enjoy your automatic climate-controlled atmosphere. 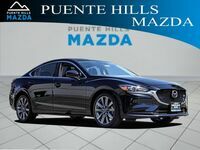 The 2018 Mazda6 is available here at Puente Hills Mazda.